The Davao City Prosecutor’s Office has subpoenaed Senator Antonio Trillanes IV to submit a counter-affidavit to the libel case filed by presidential son Paolo Duterte and his brother-in-law Atty. Manases Carpio within 10 days. The subpoena was issued by Prosecutor III Faizal Padate on September 10. Trillanes said he will face the libel charges filed against him by former Davao City vice mayor Paolo Duterte and his brother-in-law Manases Carpio. If needed, Trillanes said he will personally go to Davao City to respond to the complaint. In a press briefing Tuesday, Trillanes said he received Monday the supboena issued by the Davao City Prosecutor’s Office, asking him to submit his counter-affidavit on the libel complaints by Duterte and Carpio within 10 days. “Mukhang pinapaspasan ‘yong libel case. Very obvious na naghahanap ng paraan to shake me down, to harass me. Pero haharapin po natin ‘yan (It looks like they are expediting this libel case. It’s very obvious that they are looking for ways to shake me down, to harass me. But we will face it),” he said. Although currently facing possible arrest from the invalidation of his amnesty, Trillanes said he might go to Davao City. “Kung kailangan puntahan para maayos yan pupuntahan ko (If I need to go there to fix that, I will),” he said. Trillanes, however, raised possibility that the eldest son of President Duterte would supposedly attempt to influence Davao City judges to decide in their favor as he claimed that the judges are receiving “special allowances from the city government. “Alam niyo yong mga judges dyan sa Davao Cty ay nakakareceive ng special allowances from the city government. Iyong kapatid ang mayor, so maliwanag na medyo makaka-impluwensya na ‘yon,” Trillanes told reporters. Trillanes said he is considering to have the case transferred to the Department of Justice in Manila. The case stemmed from an interview of Cebu-based radio station with Trillanes September last year. In the phonepatch interview, he alleged that Duterte and Carpio extorted from Uber and other ride-sharing companies in Cebu City in conspiracy with Land Transportation Franchising and Regulatory Board Region 7. He also claimed that the two extorted from the Road Board and Department of Public Works and Highways. Duterte, in his complaint, called the allegations “false, baseless, unfounded,” saying they were based on “hearsay” information and a part of black propaganda against him and President Duterte. 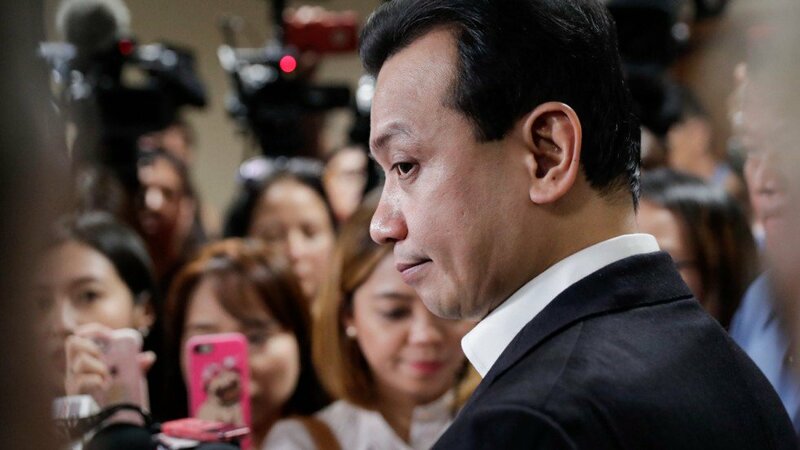 When asked about his claims on Tuesday, Trillanes said he does not remember making such statements as he dismissed them as petty, compared to his allegations about Duterte’s links to the drug trade and smuggling. “Hindi ko nga maalala kung ano yon. Pero hindi tungkol doon sa links niya sa illegal na droga. Hindi ba mas mabigat yon. Pero hindi niya ko doon kinasuhan,” Trillanes said.